Can you recall a moment in time when you were emotionally captivated by the power of a particular place? A time when a moment’s experience was forever etched into your mind? Andersonville National Historic Site is such a place. 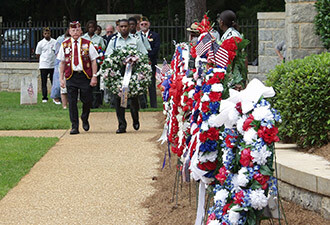 As the national memorial for all American prisoners of war, Andersonville echoes the spirit of those who believed in their country and were willing to give all of themselves for it. 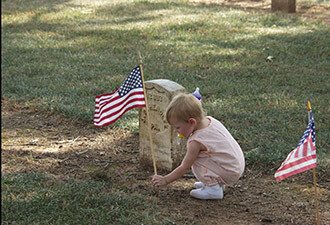 Especially on Veterans Day, we pause to honor their commitment and sacrifice. On special occasions including the weeks surrounding Veterans Day and Memorial Day, American flags line the roads throughout Andersonville National Cemetery, providing waves of movement and dashes of color amid the sea of white marble headstones. 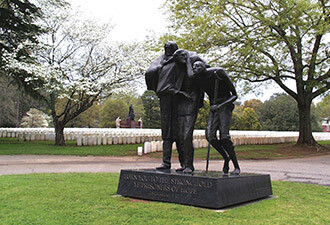 Although veterans can still be interred in the cemetery, almost 13,000 of the present interments are from the Civil War— Union prisoners of war who perished in the nearby prisoner of war camp. Although Andersonville Prison, officially known as Camp Sumter, is still remembered for its horrendous conditions and high death rate, it symbolizes the failures of camps both North and South to adequately meet the needs of its prisoners of war. Today the prison site is quiet and tranquil, but there are reminders of its past. Wells dug by the prisoners for water, reconstructed stockade walls, makeshift shelters, and earthen fortifications dot the landscape. Self-guided audio tours are available and park rangers conduct daily talks about the prison site. In March, living historians portray Confederate guards and Union prisoners of war. Visitors can see firsthand what life in Andersonville Prison was like and experience the site at night on a ranger led walk. A must-see is the National Prisoner of War Museum. Constructed in 1998, the museum is dedicated to the men and women of America who suffered captivity so others could remain free. Their story is one of sacrifice and courage, their legacy, the gift of liberty. You can see a ship model crafted during the War of 1812, stand at the “sack of cement” cross made by prisoners of war at Camp O’Donnell in the Philippines during World War II, and watch excerpts from the park’s 960 oral history interviews. Often, you will have the opportunity to talk with former POWs – men and women who know the challenges one faces when their freedom is taken away. These volunteers, part of the park’s Prisoner of War Guest Host program, share their stories with Andersonville visitors and travel to local schools and universities. The Wisconsin monument has stood for over 100 years within the boundary of Andersonville Prison. Etched into its granite stone are the words “To Live In Hearts We Leave Behind Is Not To Die.” Every visitor to Andersonville National Historic Site is a testimony that our nation’s prisoners of wars will never be forgotten and that their sacrifices are not made in vain.